Adventures On The Southside: Four! A very very happy birthday for the both of you !! 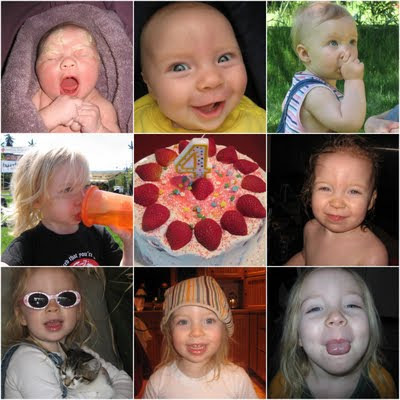 Many happy returns--she is ADORABLE! Happy Birthday Lola. Wishing you another year full of growth, discovery, and adventure! Ahh! Four is such a good age! Lola's 4?!!! wow it seems like only yesterday our babies were well, babies!!! Happy Birthday Lola girl...I'll always remember you as that little peach fuzzy haired, chubby cheeked fleece romper wearing infant...and of course who could forget that adorable smile! gefeliciteerd! ja, ongelofelijk he, mijn meisje is net 3 geworden! Happy Birthday Hanneke! She shares the same birthday as my first husband and he was very kind, creative and generous. She is in good company! Visiting from SITS. She's adorable, happy birthday to her! We do love that little girl....excuse me...BIG girl!